Everyone loves the old world charm of Tiong Bahru – CNN Travel thinks it is Singapore’s hippest ‘hood’ and Travel and Leisure Magazine deems it as Singapore’s most charming neighbourhood. Come on this walk with our guide Charlotte Chu to learn why this area was once called the ‘Hollywood of Singapore’. 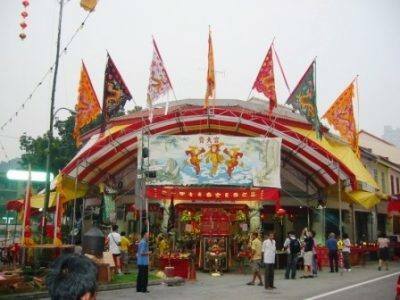 Visit one of the oldest temples in Singapore and learn about the man who donated the land for it. Hear about the fascinating hobby of ‘Bird Singing’ and stop by the location ‘new’ and ‘old’ bird singing corners. Tea will be at the famous Tiong Bahru Market where we can sample some delicious hawker food. Towards the end of the walk, a treat awaits! It is Monkey God’s birthday and there will be opera performances and lots of festivities plan for the whole day. Please sign up early; bookings will close on Friday, 15th February 2019.